Home to Morocco's primary international airport, Casablanca is the main gateway into the country for many visitors and often their first taste of the country. This city is an industry and business powerhouse, and compared to the exotic charms of Marrakesh and Fes, it can't compete. There is a European touch to much of its architecture, and the city has a modern swagger that is unseen in other parts of the country. Although Casablanca's tourist sights and attractions may not be as obvious as those elsewhere, you will find some gems if you dig a little deeper. The medina district is a charming area and much smaller (and easier to navigate) than those elsewhere. And the colossal Hassan II Mosque is top of the list on most sightseeing checklists. On the shoreline, just beyond the northern tip of Casablanca's medina (old city), the Hassan II mosque dominates the entire city. Finished in 1993, it is the second largest mosque in the world, covering two hectares in size with the world's tallest minaret (200 meters high). The prayer hall can accommodate 25,000 worshippers, while the courtyard (which boasts a retractable roof) can fit another 80,000. Astonishingly intricate decoration covers every centimeter of surface. The location, right on the tip of the rocky bay above the ocean, is thoroughly dramatic. Non-Muslims can visit the mosque on guided tours, which begin at the mosque's western entrance several times per day. Although Casablanca's old city district may not have as much exotic atmosphere as the medinas of Fes and Marrakesh, the maze-like tumble of alleyways still hides much to discover. Authentic tradesmen sell their wares to shoppers, with the butcher, the baker, and the candlestick maker all accounted for. It's a rambling and ramshackle neighborhood with an authentic residential feel, and a great place to experience the pulse of Casablanca life. There are also some interesting holy men koubbas (shrines) in the medina's southern section. Place Mohamed V is the central plaza of Casablanca. It is home to many of the city's important official buildings, including the main post office, Palace of Justice, Prefecture, French consulate, and the main Bank of Morocco. The building facades all sport the neo-Moorish style that French Resident-General Lyautey planned out for the city as he set about modernizing Casablanca in the early 20th century. The square has a central fountain and well-tended gardens. During the evenings, it is a local favorite spot for promenading. Casablanca's Corniche (beachfront district) in the Ain Diab suburb, is the city's vortex for those who want to see-and-be-seen. Much of the shoreline is now home to luxury hotels and restaurants. During the day, the many beach clubs here do a roaring trade with sun worshipers lapping up the rays and splashing in the club swimming pools. Further along the shoreline is the public beach. On sunny weekends, this is a great spot for people watching, with plenty of local families heading to the sand for picnicking and promenading. This graceful cathedral was built in the 1930s, and its architecture is a harmonious blend of both European and Moroccan style. Unfortunately, it has been left to wither in the past few decades, and is now in need of serious restoration. But even in its current dilapidated state, the structure is still beautiful. If you're lucky, the guardian will allow you inside where you can capture a sense of this building's past glory. Nearby is the Notre Dame de Lourdes, a church lit by a vast stained glass window covering more than 800 square meters. 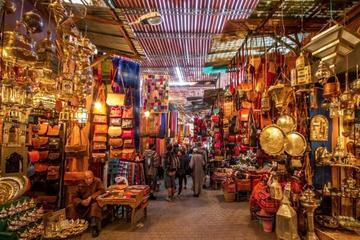 Casablanca's bustling central market is a must for tourists who want to throw themselves into the midst of city life. Right in the city center, the market is where locals come to buy and sell - be it housewives bartering for vegetables, or grocers yelling out their special deals. It's a great opportunity for photographers and fun for everyone else. You'll find everything here from plastic bowls to Morocco's famous slippers. You never know, you might be able to snag a few bargains for yourself during the visit. 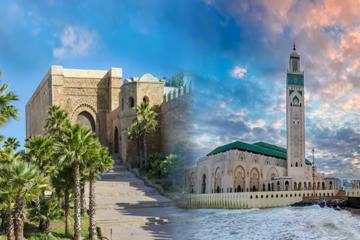 This sleepy seaside city offers some fine beaches, and is a relaxing alternative to staying in Casablanca. Although home to Morocco's second largest port, Mohammedia and its tranquil charms haven't been affected by the industry. The little medina is a delight to wander through, while the New Town area is attractively laid out, with grand palm-tree-lined boulevards. On the coast, it's all about the beach. Cafes and restaurants here bustle with activity on summer weekends when half of Casablanca seems to escape to Mohammedia's sand. Safi has been an important port since Roman times, but it was the Almohade rulers who surrounded the city with grand ramparts and made it an intellectual and spiritual center. The Portuguese occupied the city in 1508 and added to the architecture by building the stately Dar el Bahar Fortress on the shoreline - now the town's most recognizable monument. Safi is Morocco's most famous ceramic center, and once you've visited the fortress, Safi's medina is a great place to spend an afternoon. Pottery Souk and the National Ceramic Museum are the old town's star attractions. This charming seaside village has a chilled-out vibe that's perfect if you're worn out after visiting Morocco's imperial cities. The lovely beach and the Saadian era Kasbah (fortress district) are reason enough for a trip here, but for many others Oualidia is all about the oysters. Oualidia's oyster beds are famed throughout the country. Local restaurant menus list oysters and plenty of other seafood pulled fresh from the sea that day, making the town a highlight for any traveling foodie. When tourist boards started promoting Morocco's Atlantic coastline, they somehow left little Azemmour off the list. But this village has a history stretching back to Punic times, and a wonderful handful of sites showcase that long tenure. The adobe ramparts encircling the medina area are an obvious attraction and they connect to the Kasbah (fortress) that dates from the 16th century. The beach is also one of the best along the Atlantic coast - and is a well-kept secret. Indeed, half of Azemmour's charm lies in the fact that nobody else seems to stop off here. For a small town, El Jadida is packed full of interesting things to do and is surrounded by beautiful strips of sand, perfect to flop onto when you've dosed up on history. In the Citadel area, built by the Portuguese, you can scramble up onto the walls for excellent sea views and then visit the old prison, which also once functioned as the town's synagogue. Also in the citadel area, check out the atmospheric cisterns, which date from the 16th century and were used as a filming location in the famous Orson Welles' movie Othello. The origins of Casablanca can be traced to the medieval town of Anfa, which is now one of the city's suburbs. Anfa became the capital of a Berber principality in the aftermath of the Arab invasions of the 7th and 8th centuries. The Berbers embraced Islam but quickly succumbed to heretical doctrines, setting up their own prophet and a Qur'an in Berber language. The principality was known as Berghouata, and its tribal inhabitants joined a Kharijite rebellion against the Arab governor of Tangier. In the 11th century, the Almoravids waged holy war against these heretics, who were finally defeated by the Almohad Sultan Abdul Mou'min. The town came under the influence of the Merenids during the 13th century, but eventually became independent as the dynasty weakened. The Portuguese destroyed the town in 1468 in reprisal for piracy. Portugal sent a fleet of 50 vessels and 10,000 soldiers to occupy the town, which was sacked and then abandoned. But piracy soon revived, and the Portuguese returned in 1515 and destroyed the town once again. In 1575, the town was rebuilt, fortified, and renamed Casa Branca by the Portuguese in an attempt to establish control over the area. However, the Portuguese rulers fell under constant attack by surrounding Muslim tribes and were finally forced to abandon the town following a terrible earthquake in 1755. Under the reign of Sidi Mohamed ben Abdallah (1757-1790), the town was rebuilt with a mosque, madrasa, hammam, and a fort and renamed Dar El Beida (The White House), which the Spanish eventually translated as Casablanca. Luxury Hotels: About two kilometers from the Hassan II Mosque and within walking distance of the Old Medina, the Sofitel Casablanca Tour Blanche, with a spa and heated indoor pool, is popular for its friendly staff and chic, jewel-toned guest rooms. Breakfast is included in the rates. Steps from Place Mohamed V, the boutique Hotel & Spa Le Doge resides in a grand Art Deco Villa, with glamorous rooms, great food, and attentive service. If you prefer to stay in an oceanfront resort, the Four Seasons Hotel Casablanca exudes contemporary Moroccan elegance. Facilities include a day spa and an outdoor pool and Jacuzzi with private cabanas. Mid-Range Hotels: Right next door to the Four Seasons, the oceanfront Pestana Casablanca is a great option for families or extended stays with its apartment-style accommodation. In the city center, a short drive from the Old Medina and less than three kilometers from the Hassan II Mosque, the pet-friendly Kenzi Tower Hotel boasts great city views from its upper-floor rooms, and the hotel has free parking, a swimming pool, and fitness center. Also popular in the mid-range, the Kenzi Basma is within walking distance of the Old Medina. Budget Hotels: Ibis Casablanca City Center, with basic modern rooms, is opposite the Casa-Port railway station and also offers easy access to the Old Medina. Right across from the Casa Voyageurs railway station and about two kilometers from the central market, Al Walid Hotel has clean, modern rooms with free Wi-Fi, while the nearby Ibis Casa Voyageurs is another affordable option close to public transport in the city center.